The 33-year-old royal and 36-year-old actress announced their engagement Monday morning and made their first public appearance together just a few hours after the announcement. They were introduced by mutual friends in July 2016 in London. “His Royal Highness The Prince of Wales is delighted to announce the engagement of Prince Harry to Ms. Meghan Markle. The wedding will take place in Spring 2018. Further details about the wedding day will be announced in due course,” said a statement released by Kensington Palace. For the photocall, the couple walked hand-in-hand through Kensington Palace's Sunken Garden. Prince Harry sported a blue suit and black tie, while Meghan donned a Line the Label cream wrap coat over a black dress by P.A.R.O.S.H. She paired the outfit with tan suede heels. We got a closeup look at the stunning engagement ring, which was reportedly designed by Harry along with Cleave and Company, Court Jewellers and Medallists to the queen. The ring, on a gold band, features a cushion diamond from Botswana, along with two outside stones from the "personal collection" of Princess Diana. "At its center is a diamond from Botswana, a country that holds special significance for Prince Harry who has visited many times since he was a child. It is also a place the couple has spent time together over the last year and a half," wrote Max Foster from CNN. 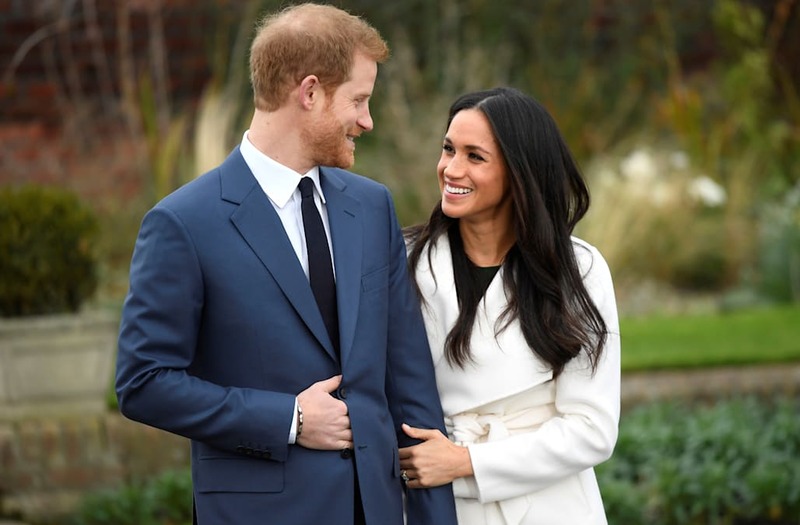 Harry, who is fifth-in-line to the throne, proposed early in November after receiving the blessing from Meghan's parents. The two will live together in Kensington Palace's Nottingham Palace and are planning for a Spring 2018 wedding.